ALL GENDER HANDICAPPED Sign 10" x 10"
Engraved Sign Horizontal 2" x 8"
Engraved Sign Vertical 18" x 2"
With raised tactile lettering and Braille, this sign is ADA compliant and current with all ADA rules and regulations. Our ALL GENDER HANDICAPPED Sign shows all patrons that your business is welcoming and approachable. Choose from multiple color options and select from a wide variety of mounting choices to fully customize your sign. 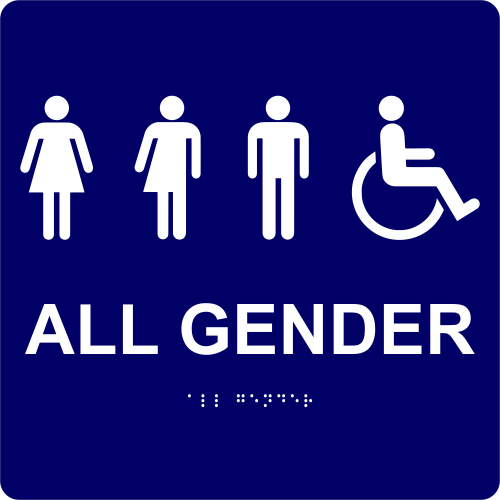 Order this ALL GENDER HANDICAPPED Sign today!